We took two young kids across Tokyo in rush hour to take part in this and it was well worth it despite the headache. The venue is great, the staff couldn’t do enough for us and the sumo were awesome. We will treasure the photos from this experience. Do not miss this! 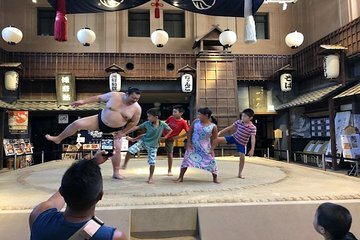 Amazing experience, the sumo ring was nice, the translation was very good, the exhibition of the sumo wrestlers was good, and the sumo wrestlers were extremely friendly so we really enjoyed the whole experience.